CONGRATS girl! I KNOW how much you love those PB stamps!!! You do wonders with them! This card is no exception! Totally CUTE! Woohoo!! You an PB are a perfect match!! I am so happy for you my friend!! I know how much you love them. This card is just adorable!! I just love all the white with the lavender. Perfect coloring! CONGRATULATIONS SWEETY!!! They are so lucky to have you :) !!! Your card is fabulous! L.O.V.E it!!! Congrats Denise!!! Everything you make with the PB stamps makes me want them!!! This little guy is totally adorable!! Super sweet card and Congrats to you! CONGRATULATIONS... I am so excited for you. You will rock these stamps.. LOVE this one.. So happy for you..hugs. Congrats!! I am just as excited since I will get to see more of your wonderful creations using the cute Penny Black stamps! So happy for you!!! Good for you! I just love seeing what you do with these little critters! Well it looks like the folks at Penny Black know a magnificent artist when they see one. Congratulations on your permanent gig with them. Your little Hedgie is adorable. What an adorable CAS card. Oh, YAY!!!!!! Congratulations, girlie!! You rock! So pretty!! Love the white with a splash of color! Yay! That awesome Denise, congrats!! And they are so lucky to have such a talented and wonderful addition to their team! I love PB too...and you always bring their images to life with your fantastic coloring and layouts! Huge congratulations, Denise!!! It is so exciting to get to work with companies we love. I can't wait to see everything you create for PB! Adorable card! CONGRATS to you! That is fabulous news and lucky for THEM, too ;) YOu do awesome stuff for them! Congratulations Denise! I love penny black images! Your card is fabulous! I love all the white space, the stitching, and the beautiful bow. Congrats! And this is just precious! Congratulations, Denise! You'll be a great asset to the company as you always rock their sweet images! 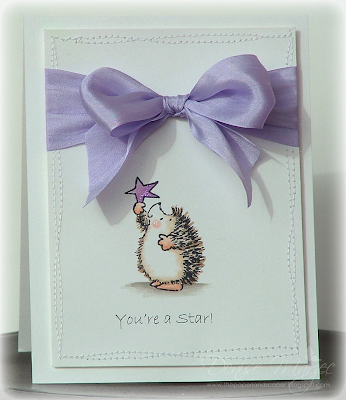 LOVE this little hedgie with the pop of purple! Oh My Gosh, huge congratulations Denise!!!! To work with something you enjoy so much is fantastic, and it shows with this SWEET card!! I LOVE LOVE LOVE the ribbon!! Congratulations!! How exciting for you, & for us!! I love seeing your PB creations, this little cutie is no exception. So simple, yet something I would not be able to duplicate, lol!! Love the lavendar ribbon --the color is gorgeous! Congratulations, Denise! I'm so happy for you. Love the cards you make! Happy Holidays to you and your family! Hugs!! This card is adorable, how clever to use this as a non christmas image. I love the splash of purple and that bow is to DIE for!!!! Woo Hoo! Congrats Girl! I'm so thrilled for you, you're perfect for them! Your card is so adorable! Congrats Denise! I could almost see that coming LOL! Adorable card and fabulous "non Christmas" rendition of that sweet image! Congratulations! You cards are beautiful and an inspiration! Hi Denise, CONGRATULATIONS!! WOO HOO! Congratulations. It's no surprise..... your work is amazing. CONGRATULATIONS!!!!!!! I am so happy for you!!!!!! This card is so beautiful - love the pop of colour and all the sewing!! Beautiful colouring as always!!! Fabulous! Hey, you're a star, Denise! Who wouldn't want you on their team? Adorable clean and simple card. Love it! I KNEW it!! You are amazing with their stamps...completely amazing!! CONGRATS Denise!! That is AWESOME!! HUGE HUGE HUGE congrats!!!! They are lucky to have you!!! Your coloring is amazing!!!!!!!!!!! !